Apple has updated its support site to allow customers to initiate screensharing with support representatives, notes 9to5Mac. Previously, Apple representatives had to request a customer enable screensharing if needed for troubleshooting. 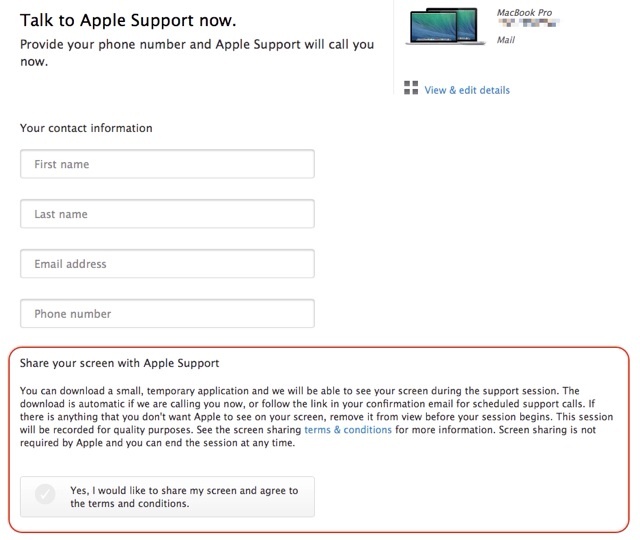 Customers have always been able to request screensharing, at which point the AppleCare representative would instruct them to download an application from Apple’s site that facilitates the connection. Now the download is listed directly on the support page. If a customer opts to use screensharing, the AppleCare rep must comply with their request whether they think it will help or not. The screensharing option is only available for support phone calls, not live chats.